The number of claims for Jobseekers’ Allowance in Wandsworth dropped, very marginally, in June. Given that the national news is reporting a record rise in unemployment, the fact we’ve had a small drop in claims has to be good news. The fall was small, just 82, and there are caveats (these are people claiming benefit, which isn’t the totality of unemployment) but as I have said before there is reason to be confident in Wandsworth. I’ve also put together this chart, which shows the rate of claims over the past year for Wandsworth, London and Great Britain. It shows two things. 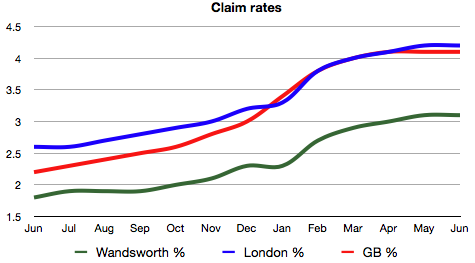 First, Wandsworth has a significantly lower rate of JSA claims than London or Great Britain as a whole. Second, and most importantly, the gap has widened. Last year Wandsworth’s rates were 0.8% and 0.4% below London’s and Great Britain’s rates respectively. This had increased to 1.1% and 1.0% this June. Again, I can add caveats, Wandsworth’s economy is a small part of the nation and will be affected by the national recession. And because it’s small it can be more susceptible to large swings. However, although I am pessimistic about the recession nationally, I remain confident that Wandsworth can weather the storm better than many other places. We’ve created a dynamic economy here; we aren’t immune to recession, but we can fight it better. The Wandsworth total of JSA claimaints (people actively signing on as unemployed) was 6,348 (a rate of 3.1%). This is a drop of 82 people, or 1.3% (or a -1.3% increase, as Gordon Brown would probably call it) on the month. The figures are still considerably higher than last year, 2,607 extra claimants, an increase of 69.7%.